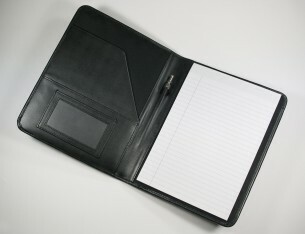 The Knightsbridge Executive leather A5 folder is available in black only. This high quality item consists of a leather internal spine and useful pockets. A fantastic promotional item to give away to your most valued customer. Brand these with your logo and company details and be kept and remembered forever. Made of Knightsbridge leather which a smooth soft leather and has a thin, water resilient coating, meaning stains, dirt and water can be removed easily by a quick wipe. Comes in black leather.